World Smile Day is held on the first Friday of October every year. Ever since the ’70s, at least as far as I remember, the smiley symbol has been associated with a smile. Just today I was look at some pictures that a colleague was showing me of a slum in our city. The ‘before’ picture showed an open drain and the ‘after’ picture had a manhole. For some reason, the manhole cover in the picture looked like a smiley – the border created a circle and the handles formed a smile. We both laughed at how appropriate it was. Today, I thought I’d go back a little and find out more about the symbol. 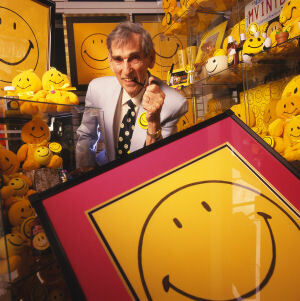 I found the wonderful story of Harvey Ball, the creator of the original smiley face. Harvey Ball was decorated World War II veteran, who started his own advertising agency after the war. In 1963, he was asked by an insurance company to create a visual icon to demonstrate ‘friendliness’ to boost low employee morale. … hired Ball to sketch something to be used on buttons, and Ball came up with a smiley face on a bright yellow background. The original design consisted only of a grinning mouth but Ball, realizing the button could easily be inverted to send the wrong (i.e. “frowny”) message, decided to add eyeballs. The left eye was deliberately created slightly smaller than the right in order to humanize the drawing through its imperfection. The design took him less than 10 minutes to complete. He was paid $45 for his work. Neither Ball nor the insurance company bothered to copyright the creation. In an interview with the Telegram & Gazette, Harvey’s son Charles Ball said his father never regretted the missed revenue opportunity. “He was not a money-driven guy,” said Charles. When a big supermarket chain took the symbol and started to commercialize it – it seemed to have lost its value. Today on World Smile Day, let’s remember the real message behind the smiley symbol and smile and pass it on. I didn’t know there was a world smile day! Why everyday is not a must smile day? I make it a point to smile everyday. these days i have to burst out in giggles with the little one though. But even in bad times i have made it a point to smile, even if that is to smile at myself! Thanks for spreading these smiles, Corinne. Thanks for sharing this story. Such a simple concept hence the smiley still lives. I never knew there was a world smile day. Perhaps we need to make each day a smile day. Thanks Corinne for this interesting story!!! Happy Smiling !!! I enjoyed this story enough to do some more research. Boosting morale at an insurance company due to a merger – back in 1963. Even then! But now I also know there was a walking trail named after Ball in Massachusetts, and perhaps one day I will walk it – and smile. Wow. Never knew about this . Thank you for sharing,Corinne. Glad you liked it, Apeksha. Thanks for sharing the story behind smiley Corinne. Never knew about the message behind the design of symbol. I just learned about this myself, Mahathi and thought I should share.